These are the basic structural units of lipids. Lipid is the general term which refers to dietary fat. The body can synthesise many fatty acids. 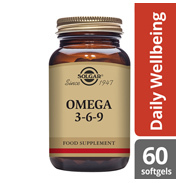 People that can't manufacture in adequate amounts must be obtained from the diet, and are called essential fatty acids. Fatty acids can be saturated, monosaturated or polyunsaturated depending on the degree to which the basic carbon chain of the molecule is filled with hydrogen. The two essential fats are defined as linolenic – an omega 3 fatty acid and linoleic acid an omega 6 fatty acid. These terms refer to which carbon atom of the fatty acid molecule the first double bond is located. Many nutritionists and scientists feel the western diet emphasises omega 6 fatty acids while omega 3 fatty acids are under-consumed. Including more omega-3 rich foods in the diet and decreasing the consumption of red meats, hydrogenated oils and other saturated fats may protect us against many of today’s degenerative diseases. 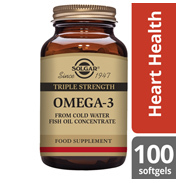 EFA’s are found most abundantly in fish oils and unadulterated seed oils such as canola, sunflower and safflower oil. 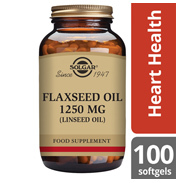 Flaxseed oil is an exceptional oil containing both essential fats in appreciable amounts. Flax, also known as linseed, is nature’s richest source of omega-3 fatty acids. 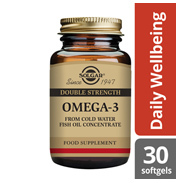 Cold salt water fatty fish such as herring, haddock, cod, mackerel and salmon are also rich in omega-3 polyunsaturates and serve as the source of fish oil supplements. 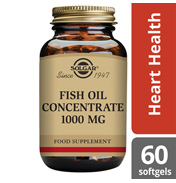 Solgar offers fish oil concentrate which are a rich source of omega 3 fatty acids. 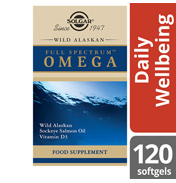 Their Omega-3 700 softgels provide 700mg of omega 3 fatty acids per softgel and their Flaxseed Oil softgels contain a source of omega 3, 6 and 9. Their Borage Oil and Evening Primrose Oil are both sources of omega 6.